How did someone with no modelling experience go from caring for her siblings and helping her Mom clean homes and offices to being THE face of Christian Dior? 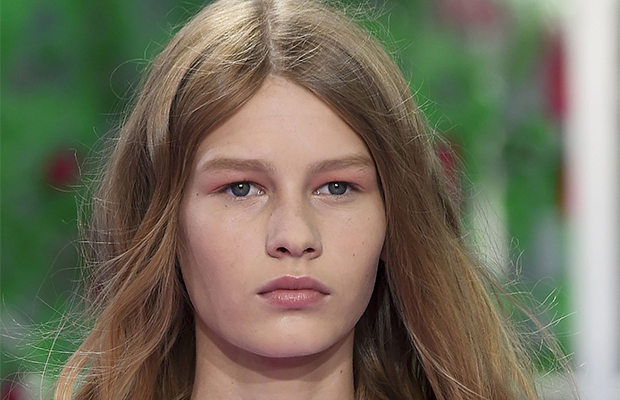 14-year-old Sofia Mechetner’s meteoric and unprecedented rise to the pinnacle of fashion modelling is a modern day fairy tale featuring ups and downs, twists and turns, culminating in a very happy ending. Bear with me, this is a crazy story as documented in a video (Hebrew) by Channel 2. Sofia Mechetner in the room that she shares with her younger brother and sister. Sofia’s Russian born parents divorced and her father left the family 4 years ago. Sofia’s mother was forced to work at all hours as a cleaning woman, earning a paltry 4000 shekels a month (just over $1000). This was barely enough to keep her 3 children fed and housed in a one bedroom apartment in Holon, a suburb just outside Tel-Aviv. Sofia stood 5’8″ and on an almost daily basis, people told her to try her hand at either basketball or modeling. She couldn’t play basketball so she found her way to the Roberto modeling agency in Tel Aviv. So impressed was Roberto with Sofia’s look, that he decided to throw all caution to the wind and pitch Sofia to the super exclusive Viva Agency in Paris. A trip to Paris with a chaperon was arranged, as well as a photo session with Viva. When Sofia showed up at Viva’s offices, it was decided that her photo shoot would be cancelled because she was too young. Disappointed, Sofia and her chaperon decided to make the most of their remaining 36 hours in Paris and do some shopping and sightseeing. They passed a Dior shop and decided to step in when who should be behind the counter but none other than Raf Simons, Christian Dior’s head designer – he took over after the whole John Galliano, unhinged, anti-Semitic rant thing in 2011. Sofia must have made quite an impression on Simons, to say the least. Weeks later, when Sofia was already back to her regular life in Holon, Dior called Viva, who called Roberto, who called Sofia. Dior wanted Sofia to open their show at Paris Fashion Week. Sofia had never been on a catwalk, had never done any modeling at all, and now she was the face of Dior! As the new face of Dior, Sofia’s first pay check was for nearly one million shekels, or about $250,000. Sofia’s first call was to her Mom to let her know that she could safely quit her cleaning job. She is looking forward to a larger apartment where she could hopefully have her own room and where she could eat Corn Flakes more than once a month. “Corn Flakes” in Israel is a generic term for all cereal. Sofia has been compared to fashion models Anna Ewers as well as Kate Moss, who has also worked for Dior. It’s hard to say what exactly the future has in store for Israel’s newest celebrity, but expect to see a lot more of her in ads and on the covers of fashion magazines. At 14, she has a long career ahead of her – her IDF army service doesn’t begin for another 4 years! And what are the BDS ramifications? Pretty much none. Sofia is not Dior’s first Israeli – Natalie Portman signed on to promote Miss Dior and the results have been stunning! No one’s boycotting Christian Dior any time soon. Best of luck to you Sofia. Stay real, never change! Thanks Yuval. I’ll keep that in mind – although you should know that we’re in Jerusalem!